From all the information I’ve gathered it seems West Vancouver ranks among the most expensive neighborhoods in the Vancouver area, and it doesn’t take long to grasp why: big villas were strategically placed to get the most breathtaking views over the ocean front. Additionally, West Vancouver has a long beach and a quaint little street with cute cafes, bistros, and restaurants. We ate breakfast in West Vancouver on one of the mornings and it was delish. 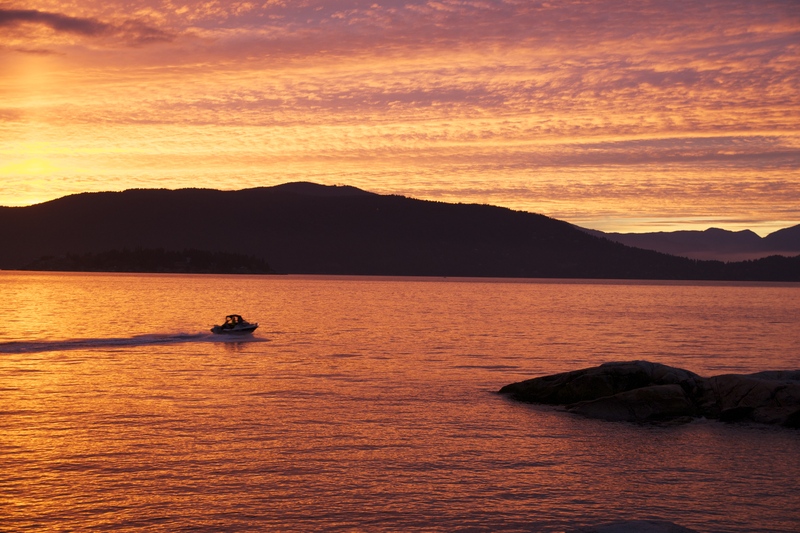 West Vancouver is also blessed with a beautiful oceanfront ocean front national park, namely the Lighthouse Park. It’s a quaint stroll through a beautiful forest. Looking up at the trees I got a bit dizzy because they are just so old and so tall. Some of them were knocked down by storms and covered in beautiful lush green moss. It’s just such a treat walking here. The Lighthouse Park doesn’t seem to be the most touristy place, which I loved. We only came across people once, but they were already on their way out of the park as the sunset and darkness came closer and closer. In my humble opinion, that was their biggest mistake on that day because we experienced the most colorful and mind-blowing sunset just about 30 minutes later. On our walk through the woods, we even spotted an owl. It was just sitting there on the branch of a tree doing what owls do best: being majestic and gorgeous. Now, I’ll let the photos do the talking. And then, it got epicly spectacular! The light was changing every few seconds. And this is how you take a #selfie.